Former Breitbart reporter Michelle Fields repeated her contention Monday night that Breitbart editor Matthew Boyle spoke with Corey Lewandowski on the phone immediately following last week’s “GrabGate” incident. Fields told Megyn Kelly last night on Fox News’ Kelly File that Lewandowski, Donald Trump’s Campaign manager, admitted that he was the culprit and indicated that an apology would be ensuing. She also alleged that Boyle had tried to put a positive spin on the imbroglio because it meant that Breitbart would get more access to the Trump campaign as a result. Loyalty is a two-way street. No one would begrudge Breitbart for standing behind its reporter. Even if the entire incident unfolded as a misunderstanding, there would be zero blowback from anyone in the press for Breitbart taking a position supporting one of its own. Because its alignment with Trump has created a massive conflict of interest that has finally erupted into the public view. That is the lens with which Breitbart has viewed this incident from the very beginning, and underscores the inherent doubt it had for Fields’ account. It clearly very much wanted Lewandowski to be exonerated and for Fields to be guilty of making up some perverse hoax. As I said on CNN with Don Lemon, the idea that Breitbart fully supported Fields is a lie. It just isn’t true. As the story unfolded, Breitbart became obsessed with uncovering any type of “evidence” that could disprove Fields’ account, or at the very least, create a certain amount of reasonable doubt. A news organization was working to undermine one of its own reporters. For me, this was the proverbial straw that broke the camel’s back. Breitbart had abandoned its own reporter and did so with the objective to protect Trump’s campaign. Breitbart News is no longer a journalistic enterprise, but instead, in my opinion, something resembling an unaffiliated media Super PAC for the Trump campaign. I signed my contract to work as a journalist, not as a member of the Donald J. Trump for President media network. As recent events have proven, there is no longer a point in trying to reform the company from within, so I must step aside with my dignity intact. Breitbart News has always been about being a grassroots, conservative publication, but in my opinion we are working with or perhaps even taking direction from a presidential campaign, which is unacceptable journalistic behavior. I believe Breitbart News is becoming less of a news site and more of a propaganda organization dedicated to the Trump campaign. The company sent out cease and desist letters to some of the employees who left the company in the past week, multiple sources with knowledge of the letters told POLITICO. Six staffers resigned in the past few days, citing the aftermath of how the site handled one of its reporters, Michelle Fields, accusing Donald Trump’s campaign manager of strong-arming her as she tried to ask the candidate’s attention. Several of the now former employees issued scathing statements about the company as part of their resignations, and some have given interviews on television and in major newspapers. Posted in Breitbart, Fox News. I’ve been neglecting my primary blog, today, because I’ve been busy posting at The Conversation. It’s a busy news day, plus – as you can imagine, as March 1 is the one year anniversary of Andrew Breitbart’s death, all of the Breitbart bloggers are remembering him in their own special ways. From 2009 – 3/2012, whenever I saw a political speech at a conservative conference or event – Andrew’s was always my favorite. Always. I hung on every word from this extraordinary, one in a million man. I posted so many his videos at my blog over the years, I started a category just for him. Head to The Conversation for more memories and tributes. I’ve been keeping something from my dear readers for weeks, and was about to burst. Finally, the secret can be told! On Wednesday of this week, Breitbart News will be launching a new feature/vertical on our website called “The Conversation.” Look for it in the navigation bar. The Conversation will be a place where our readers can watch an ongoing dialogue amongst a select group of thought leaders that includes Ace of Spades, Iowahawk, David Webb, Shark Tank, DocZero, Nice Deb, Jerome Hudson, Lisa De Pasquale, William A. Jacobson of Legal Insurrection, and Adam Baldwin, along with John Nolte, Ben Shapiro, Larry O’Connor, Sonnie Johnson, Liberty Chick, Jon David Kahn, as well as other writers and contributors from Breitbart News. Also, look for regular guest contributors stopping by—there are sure to be some nice surprises, and we fully expect the roster to expand and evolve—incorporating more friends and more leading voices from inside and outside the company. When we first sat down to redesign the website, The Conversation was always a central part of Andrew Breitbart’s vision. He loved dialogue and the free flow of ideas. He loved conversation and was a always a fierce proponent of more voices, not fewer—so don’t be surprised to read some alternative political views. Andrew also envisioned a place where bloggers and citizen journalists who might not have another way of conversing, interacting, and reacting publicly with each other, could do so in one central location. Yes, you read right. Nice Deb has joined the Breitbart team. I can’t tell you how proud and honored I feel to be part of the late great Andrew Breitbart’s vision – and in such great company. Some of us have been talking to each other on the site for the past week – although it’s not yet public. I can promise you one thing – The Conversation will never be dull. I will continue to blog here, at Nice Deb, as always. The idea behind The Conversation, is to keep the posts short and casual – longer than a tweet, but shorter than a full length post, so I don’t see it eating up too much of my time. Posted in Awesome, Back to me, Breitbart. Pat Moran, victim of the right-wing smear machine. /Channeling Left-wing blogger, Marcy Wheeler of “Emptywheel”…. When we last heard from Patrick Moran, son of Rep. Jim Moran, he was on video describing how to commit voter fraud. He later resigned from his father’s campaign over the video. Moran and his girlfriend were fighting outside 14th St. bar The Getaway around 1:23 a.m. on Dec. 1, according to a police report, over Moran talking to another woman at the bar. Suddenly, Moran allegedly slammed his girlfriend’s head into the bar’s metal trash can cage. After the attack, police described Moran’s girlfriend as “bleeding heavily from her nose nose and also observed that her nose and right eye were extremely swollen.” One of the ambulance technicians who transported her to Howard University Hospital told police that Moran appeared to have broken her nose and given her a skull fracture under her right eye. When I saw this story–claiming that a “violent Moran” beat his girlfriend’s face in –I knew right away it was likely a false flag. Exhibit A. “The last we heard from Patrick Moran”, he was being railroaded by Lee Stranahan’s buddy, the right wing con artist, James O’Keefe of Project something or other, in a heavily edited video that supposedly proved Moran was engaging in election fraud, but proved nothing of the sort. It was another completely discredited Breitbot hoax. Exhibit B. Stranahan works for Breitbart, need I say more? Exhibit C. Adding to the barrage of deceptive lies is the notorious, tip jar rattling grifter, RS McCain, a proven racist, who’s well known for reporting things that are not true. Exhibit D. A source from the bar says that unknown persons wearing patriotic tea-bag type garb entered the bar, and deliberately provoked the peaceful Moran, causing him to take a few swings in their direction. According to the source, Moran’s fist missed its mark and in the confusion, he ended up slamming his girlfriend into the trash can cage. The teabaggers left the bar before police and paramedics got to the scene. Exhibit E. A video of the source telling his story at the local Progressives for Progress office, has been posted onYouTube. It appears the KochBots just staged another false flag!!!11! Linked by Michelle Malkin, and Doug Ross, and Flopping Aces, thanks! Posted in Breitbart, Commies, Just Sayin', Lyin' Weasels. A beautiful tribute to the late great, Andrew Breitbart, our fearless leader in the war against the institutional left; written and performed by Chris Cassone. Video by BigFurHat. The footage of the bloggers were taken at BlogCon Charlotte,last weekend. I make an appearance toward the end – 4:20. I couldn’t make myself smile. Posted in Awesome, Awwwww!, Breitbart. Breitbart TV has released yet another damaging video that shows one of Obama’s radical buddies talking about “white supremacy”. Video here. It sorta fits in with the Derrick Bell, Louis Farrakhan, Jeremiah Wright Marxist CRT world view that some would argue our current President shares. 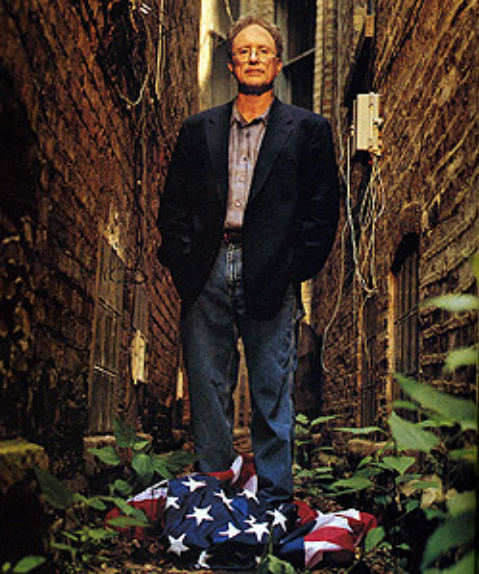 But wait – “Bill Ayers was just someone from Obama’s neighborhood, with whom he occasionally crossed paths, and who did despicable things when Obama was only eight years old. Why does it matter what Bill Ayers says. That’s just guilt by association!”, the Media Matters/Fight the Smears/Attack Watch argument goes. Because the American people would rightly reject a Presidential candidate who was close family friends with an unrepentant domestic terrorist, and “small c communist”. Never mind the fact that his political career was launched in Bill Ayers’ living room. Never mind the fact that they served on two boards together, The Woods Fund, and The Annenberg Project (where they funneled money to radical, left wing projects)…Never mind the fact that it’s now almost beyond dispute that Ayers wrote Obama’s book, Dreams From My Father. When was Obama ever “family friends” with the unrepentant terrorist? In a new afterword to his 2001 book, Bill Ayers, former leader of the 1960s radical group Weather Underground, describes President-elect Barack Obama as a “family friend” and denies he wished his group had set off more bombs in the 1960s. Ayers, a professor at the University of Illinois at Chicago, adds few new details about his relationship with Obama in the afterword to Fugitive Days: Memoirs of an Anti-War Activist. The book is being reissued this month. But right-wing commentators tried to use those connections to smear Obama, he says. It must have been very painful for Ayers to have to disavow their friendship because he couldn’t resist that little jab at Obama, there – uh, and I am a guy from around the neighborhood, incidentally.” Which is exactly how his craven former friend had described their acquaintance to inquiring reporters. I think we can all admit it, now, right? Bill and Bernardine were close enough to the Obamas that they were trusted to babysit the Obama girls. After all, they hold the same poisonous, Marxist, revolutionary, CRT world view. A blast from the past that has disturbing foreign policy implications we see panning out, today: Obama’s Stealth Socialism. Posted in Breitbart, Commies, Obamessiah, Vetting Obama.